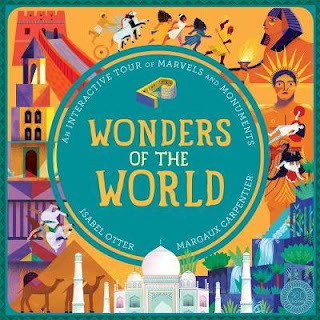 Sub-titled ‘An Interactive Tour of Marvels and Monuments,’ this book has thick, heavy cardboard pages which will withstand much opening and closing of pages and is likely to be enjoyed by readers from ages 7 to 10. Though in a board-format, the information is printed in small typeface, usually in boxes or other shapes. The book begins with a map of the world showing thirteen sites in Europe, Asia and South America, each with a key to indicate it as either a modern or ancient wonder. Some of the sites are of the seven wonders of the ancient world, such as the Lighthouse of Alexandria in Egypt and the Hanging Gardens of Babylon, and (the only still-standing ancient wonder), the Pyramid of Giza. The book then proceeds with full-page depictions of other world wonders, such as the Colossus of Rhodes, built around 200 BC on the Greek Island of Rhodes. We are told in one of the outbreak boxes that the Colossus was the inspiration for the Statue of Liberty in New York. On most of the pages are flaps which open to reveal more information. For example, there’s a little book titled ‘Olympic Games’ in the page about the Statue of Zeus at Olympia, and information under the reflection pool at the Taj Mahal in India. One of the more modern wonders shown is Christ the Redeemer in Rio de Janeiro, completed in 1931, with most of the wonders built long ago, such as Machu Picchu (about 1450) and the Great Wall of China, started in 221 BC and the longest man-made structure ever built. The full-page illustrations are bright and colourful with lots of interesting information included on every one of the book’s 18 pages. On the final double-spread are natural wonders of the world, including a pop-up Paricutin Volcano, the world’s youngest volcano which appeared a small crack in the ground in Mexico in 1943, and then grew to 304m high in ten days! Happily, it is now dormant though it erupted on and off for eight years. One of the seven natural wonders that appear is Australia’s own Great Barrier Reef.